Food and drink trends point to improved quality all around. If you’re going to eat meat, it better be good. That was one of the clear food-related themes at this year’s MUFSO [Multi-Unit Food Service Operators conference], where Nancy Kruse, in her annual State of the Plate report, highlighted the growing trend of vegetables on the center-of-the-plate, even as better cuts of meat and techniques like smoking also gain ground. Carrots, in particular, are at the forefront of innovative plant-based dishes. Their appearance on menus has grown by 124 percent in the past four years, according to menu research firm Datassential. Kruse showcased a wide variety of carrot dishes, including a “carrot steak” with hollandaise sauce and pesto at Lady of the House in Detroit as well as carrot ravioli with carrot-ricotta filling, brown butter and Parmesan, garnished with curled red, yellow and orange carrots at Mano in Atlanta. The growing presence of plants on menus was also highlighted by José Andrés’ vegetable forward concept Beefsteak—named for the tomato variety—which was one of this year’s Hot Concepts award winners. 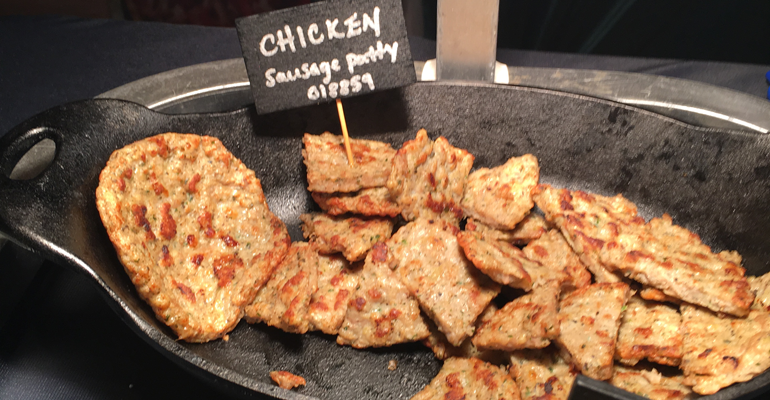 Meanwhile, on the floor of the show’s Supplier Showcase, plant-based substitutes for meat and cheese were in abundance, including Dr. Praeger’s meatless meatballs and Before the Butcher’s soy-based pulled-pork substitute. Impossible Foods, exhibited not only a variety of dressed and seasoned meatless burgers, but also quesadillas and other snacks made with its vegan hamburger cognate. Non-dairy cheese substitutes were on display from Daiya, which makes its foods out of tapioca, pea protein and other plant-based ingredients. Meanwhile, Follow Your Heart was offering cheese-like sauces and schmears made with coconut, and Good Planet Food offered non-dairy slices made from a base of coconut oil and potato starch. While plant-based substitutes are getting better and better, so was the meat on display. Pork supplier Clemens offered its Premium Reserve, a value-added brined and larded product, while Jones Dairy Farm, a meat supplier, despite the name, handed out samples of dry-aged bacon—aged 7 to 21 days—and chicken sausage made with leg meat and enriched with chicken skin. Thomas Foods International was dishing up sous vide fig and apricot lamb shoulder with pomegranate, apricot-pistachio couscous and preserved lemon gremolata. Ventura Foods even used high-quality meats to highlight its sauces. 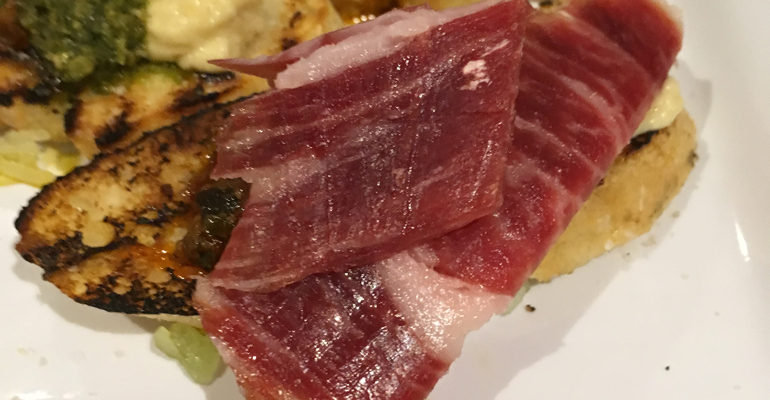 Super-premium jamón Iberico was served with a mostarda made from its smoky barbecue sauce, charred onions and pickled mustard seeds. Charred A5 wagyu was dressed with an Asian sauce thickened with tofu. The presence of smoked items on menus has grown by 29 percent over the past 10 years, Kruse said, citing Datassential. Smoke flavors were on the trade show floor, but mostly through charring, with items such as the charred onions in Ventura’s smoky barbecue sauce, and the green chiles—given a smokiness by blistering the skins — that were on offer by the New Mexico Department of Agriculture. Kruse also cited the growth of Middle Eastern food in the U.S., particularly Israeli cuisine which—following in the footsteps of Korean chefs like Roy Choi, David Chang and Bill Kim among others—has charismatic spokes-chefs such as Michael Solomonov, Alon Shaya and Einat Admony. In addition, poke, the Hawaiian dish of seasoned raw fish—usually tuna but sometimes salmon and occasionally other fish—has gained popularity across the country, Kruse said. “Poke has been kind of a shining star,” she said. 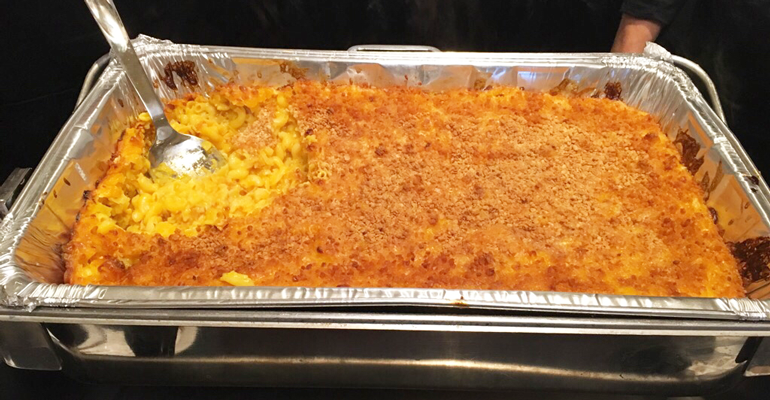 It also has inspired many chains devoted to the menu item, as exhibited by the Hot Concepts winners, which included New York City-based chain Pokéworks. Specialty soft drinks were also on display at MUFSO, including Jarritos’ line of flavors such as mandarin orange and tamarind, and Tractor Beverage Co.’s drinks including the tart Berry Patch Haymaker and the lightly carbonated lemon grass with turmeric and lime. Kruse pointed to this trend at restaurants, citing the TLC Nectar at casual-dining chain Eureka! which has turmeric, lemon, carrots and honey. Meanwhile, the Coca-Cola Company highlighted its line of Barrilitos Aguas Frescas with a large display at the Supplier Showcase—attendees seemed particularly intrigued by the cucumber-pear—and at the annual Shake, Sparkle & Stir cocktail competition, in which the competitors were required to use Barrilitos in their entries. And, not surprisingly, cold brew coffee also had a presence at the show, available from Royal Cup Coffee and bean-to-bottle organic coffee producer Lucky Jack. In a new twist, decaf cold-brew was on offer by Swiss Water Decaffeinated Coffee Company, which removes caffeine from green coffee beans through osmosis. This article originally appeared on Nation's Restaurant News a sister publication. Visit their website for more foodservice trends and insights.